To find where to stay, photos, maps, and other tourist information, you can read our Sydney trip planner . The Route module can give you travel options from your home to Sydney. In July, daily temperatures in Sydney can reach 21°C, while at night they dip to 9°C. On the 28th (Sun), you'll travel to Katoomba. Kick off your visit on the 28th (Sun): make a trip to Sublime Point Lookout, then admire the sheer force of Wentworth Falls, then admire all the interesting features of Lincoln's Rock, and finally don't miss a visit to Echo Point Lookout. For photos, reviews, other places to visit, and more tourist information, read Katoomba tour planning website . Traveling by car from Sydney to Katoomba takes 1.5 hours. Alternatively, you can take a train. Expect little chillier evenings in Katoomba when traveling from Sydney in July, with lows around 3°C. Finish your sightseeing early on the 29th (Mon) so you can drive to Pokolbin. On the 30th (Tue), do a tasting at Peterson House, then meet the residents at Hunter Valley Zoo, then tee off at Hunter Valley Golf & Country Club, and finally do a tasting at Glandore Estate Wines. To find traveler tips, where to stay, and tourist information, read our Pokolbin trip planning tool . Traveling by car from Katoomba to Pokolbin takes 3.5 hours. Alternatively, you can do a combination of train and taxi; or do a combination of train and bus. July in Pokolbin sees daily highs of 20°C and lows of 7°C at night. Wrap up your sightseeing on the 31st (Wed) early enough to drive to Port Macquarie. You'll get in some beach time at Saltwater National Park and Elizabeth Beach. Take a break from the city and head to Dolphin & Whale Watching and Sea Acres Rainforest Centre Port Macquarie. Explore the numerous day-trip ideas around Port Macquarie: Arakoon National Park (in South West Rocks) and Tuncurry Rock Pool (in Tuncurry). There's more to do: try for a hole-in-one at Port Macquarie Driving Range and Mini Golf. To see other places to visit, more things to do, traveler tips, and other tourist information, refer to the Port Macquarie journey builder . Getting from Pokolbin to Port Macquarie by car takes about 3.5 hours. Other options: take a bus; or take a train. Traveling from Pokolbin in July, expect nights in Port Macquarie to be about the same, around 9°C, while days are little chillier, around 13°C. Wrap up your sightseeing on the 4th (Sun) to allow time to travel to Yamba. Yamba is a town in northern New South Wales, Australia at the mouth of the Clarence River. Kick off your visit on the 4th (Sun): take some stellar pictures from Maclean Lookout, enjoy the sand and surf at Pippi Beach, and then get outside with Angourie Blue Pool. Keep things going the next day: tour the pleasant surroundings at Main Beach Yamba, then look for all kinds of wild species at Wildlife Areas, then kick back and relax at Spooky Beach, and finally get engrossed in the history at Maclean District Historical Society Incorporated. To find ratings, reviews, where to stay, and other tourist information, read our Yamba trip itinerary planner. Getting from Port Macquarie to Yamba by car takes about 3.5 hours. When traveling from Port Macquarie in August, plan for a bit warmer days and little chillier nights in Yamba: temperatures range from 24°C by day to 7°C at night. Wrap up your sightseeing on the 6th (Tue) early enough to travel to Byron Bay. Step out of the city life by going to Arakwal National Park and Wategos Beach. You'll discover tucked-away gems like Hastings Point Headland and Cape Byron Walking Track. There's still lots to do: get great views at Pat Morton Lookout, look for gifts at Truly Tea, and explore the activities along Lake Ainsworth. To find photos, more things to do, other places to visit, and more tourist information, use the Byron Bay online trip builder . You can drive from Yamba to Byron Bay in 2 hours. 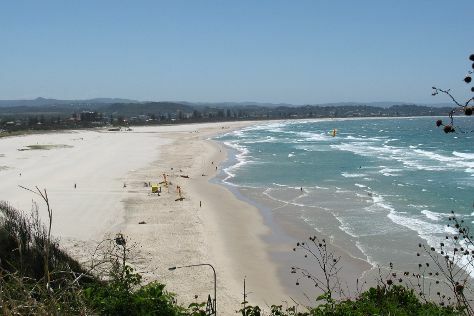 In August, daytime highs in Byron Bay are 25°C, while nighttime lows are 8°C. Wrap up your sightseeing on the 9th (Fri) early enough to take a bus to Gold Coast. Kick off your visit on the 9th (Fri): explore the wealth of natural beauty at Natural Bridge. On the 10th (Sat), you'll have a packed day of sightseeing: kick back and relax at Kurrawa Beach, explore the wealth of natural beauty at Burleigh Head National Park, and then enjoy the sand and surf at Kirra Beach. To find ratings, where to stay, maps, and tourist information, go to the Gold Coast journey maker site . You can take a bus from Byron Bay to Gold Coast in an hour. Alternatively, you can drive. In August, plan for daily highs up to 25°C, and evening lows to 11°C. Wrap up your sightseeing on the 10th (Sat) to allow time to drive to Brisbane. Kick off your visit on the 11th (Sun): identify plant and animal life at Lone Pine Koala Sanctuary, enjoy the sand and surf at Shorncliffe Beach, and then make a trip to Wheel of Brisbane. 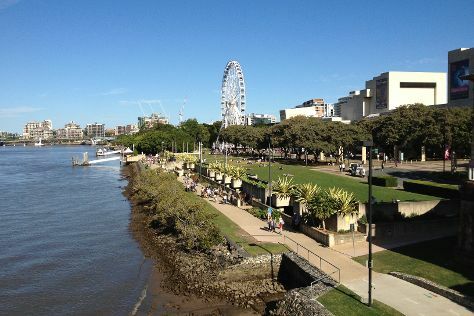 On the 12th (Mon), you'll have a packed day of sightseeing: walk around South Bank Parklands and then appreciate the history behind Bee Gees Way. You can drive from Gold Coast to Brisbane in an hour. Alternatively, you can take a bus; or take a train. August in Brisbane sees daily highs of 25°C and lows of 11°C at night. Wrap up your sightseeing on the 12th (Mon) to allow time to travel back home.